Letter [original in LP Correspondence Box #198, Folder #14 (File Kistiakowsky, G.B.)] from Dr. Kistiakowsky to LP RE: Thanks LP for his thoughtful letter and his comments on some of the men they are considering for a professorship at Harvard U. 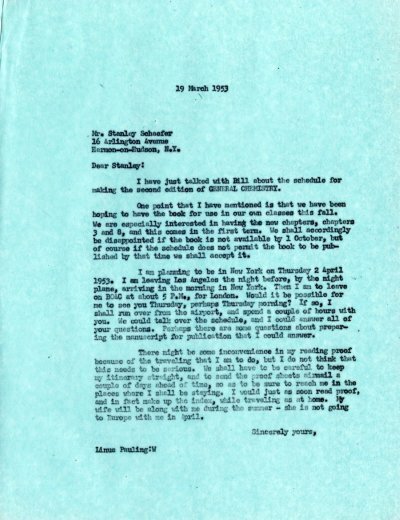 [Letter from LP to Dr. Kistiakowsky March 11, 1953]. Letter from A.A. Heist, the Citizens Committee to Preserve American Freedoms, to LP RE: Requests that LP sign a brief to be shown to the House of Un-American Activities Committee that protests the restriction of personal freedoms. Enclosed is brief. Letter from Dr. G. V. Raynor to LP RE: writes that he is grateful for LP's letter about C 14, C 15 and C 36 crystals, and is interested to see LP's conclusions about the electronic structures of the phases of those types. Is also interested to the hear the new theory of ferromagnetism from LP. Requests advance copies of the work. Also requests anything LP can tell him about his interpretation of inter-metallic phases. [Letter from LP to Dr. Raynor March 10, 1953, letter of response from LP to Prof. Raynor March 27, 1953] [Filed under LP Correspondence: Box #340, Folder #18]. Letter from Horace N. Gilbert to LP RE: invites LP to join the Los Angeles Town Hall. Goes on to describe the organization and encloses an application for membership. [Memo of response from LP to Dr. Gilbert January 4, 1953] [Filed under LP Correspondence: Box #410, Folder #18]. Letter from LP to Dr. T. J. Webb RE: writes in regard to the Hamiltonian game in a copy of "Ball's Mathematical Recreations and Essays" that he gave him. Goes on to discuss the game. [Filed under LP Correspondence: Box #444, File #1]. Letter from LP to W.H. Freeman RE: LP doesn't have a second copy of the manuscript of General Chemistry to give to Lloyd Malm. He also agrees with the correction comment, and corrections will only be made to factual errors. [In reply to February 24, 1953 letter from Freeman to LP]. [Filed under LP Books: Box 1953b, Folder 1953b.1].